We have had gadgets created for us that give us the excuse not to move. Our bodies were de-signed to move, but the 21st century machines encourage us not to. We sit at desks and click a mouse. We might get up to get a cup of tea, but we are back down in that chair for the next few hours. In the evening we sit and watch tv, or lie to read a book. If you move, the body will become better at moving. If you sit, it will learn to be really good at sitting, but you may feel aches along the way. When we do sit, we don’t sit that well. Our postures could be better. We spend a lot of our time looking at a gadget, or leaning forward, straining our necks, to look at a computer screen, or mo-bile phone. As a result, we are prone to injuries, strains and pain from postural imbalances, as well as circula-tory issues, obesity and bone density. We offer a variety of classes – barre, reformer, dancilates and matt work classes. We also offer private classes on both reformer and the Cadillac. * Pilates is perfect for the modern day lifestyle. It corrects posture, by strengthening the muscles around your vertebrae. It stabilises your spine, to straighten you. With every exercise you do, you engage your core, your powerhouse, which supports your lower back and is connected to your pelvis and upper body. * At CONTOUR we give you a whole body workout, so as well as your core and your back, you will also be toning your arms, bum and legs. * The sessions are only 55 minutes long, which includes a warm up and warm down. The classes are efficient, and you will cover every major and minor muscle group in the time. * We like to see changes happen quickly today. Results are fast in Pilates. It will tone the body, and give you long and lean muscles quickly. But you have to be consistent. * Variety and versatility are important to us at CONTOUR. We have a number of different classes on offer. Taught by different instructors. The reformer is possibly the most versatile machine on the market. * The sessions may also help ease the stresses in your life. Pilates is a mind and body workout. You have to think about what you are doing, and,therefore, shut down your mind to any worries. * Each movement is controlled by your body and breathing, so it gets you to calm your mind and focus. * Reformer Pilates will give you a whole body workout and all over strengthening. All levels wel-come. You can make the exercises even more challenging by changing the spring tension. 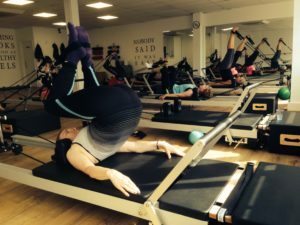 * But, if you have never done Pilates before, and keen to get familiar with the technique before moving onto the machine, you might want to try our matwork classes. * If you need to work up a bit of sweat, and get your heart beating, barre, dancilates, or Reform-HIIT, will help you do that. There are a lot of repetitions to get that burn, and to get those mus-cles shaking. Whichever class you choose, they will all give you insurance for life. They will help prevent injuries, aches and pains. They will keep you fitter, stronger and more active for longer. You can start them at any time in your life too, because they put very little pressure on the joints.